Greeting beer lovers! 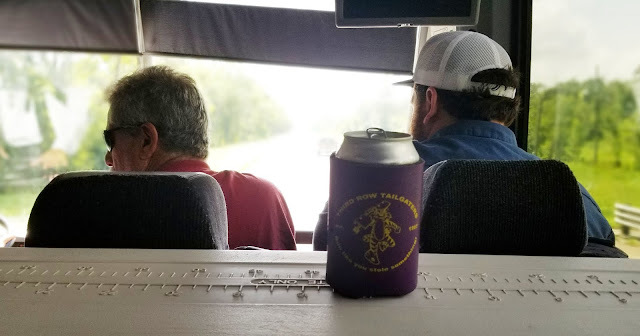 This past weekend I had the opportunity to join Jay Ducote, Matt Moscona, and Lee Feinswog on a Magical Brewery Beer Bus Tour of four New Orleans breweries. The itinerary was set out as leaving from Tin Roof in Baton Rouge, then hitting up Wayward Owl, Port Orleans, NOLA Brewing, and Urban South prior to making out way back to Baton Rouge. I have been to NOLA and Urban South a few times before, but I had never been to Wayward Owl or to Port Orleans, so when Jay gave me the invite I was happy to accept. The bus loaded up at Tin Roof, who was gracious enough to give us some low fills for the road, and the group (43 strong) made our way to I-10 East a few minutes ahead of schedule. The tour package included two beers at each stop for everyone, but we were of course free to purchase additional beers and food along the way. Tin Roof for the ride. Traffic was light for a late Saturday morning and we ended up rolling up to Wayward Owl a few minutes ahead of our anticipated arrival. They were kind enough to open up early just for our tour and the drinking commenced! 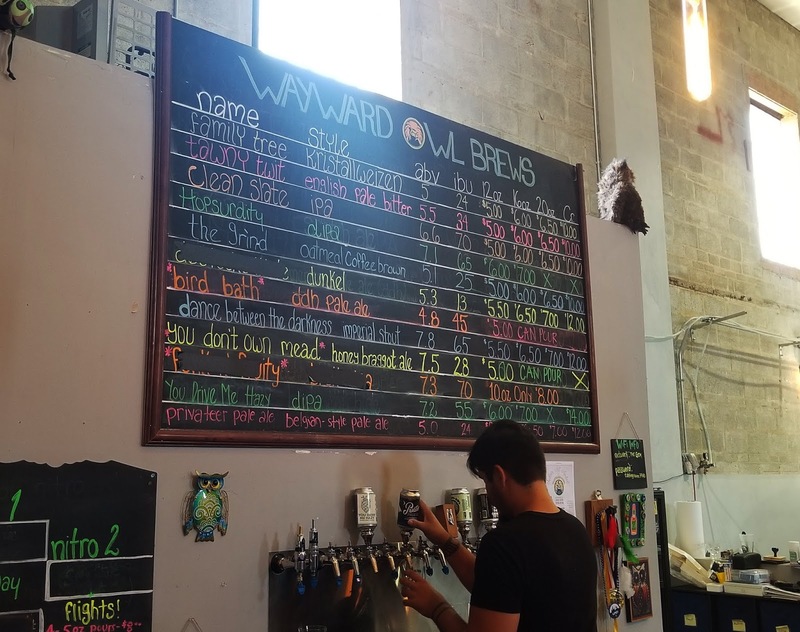 Wayward Owl is a new stop for me, and my first impression was that they did a really excellent job with the space, an old theater that is now serving as both brewery and taproom. I tried several beers here, including the You Drive Me Hazy DIPA, the Dance Between The Darkness Imperial Stout, and the Hopsurdity DIPA. Probably not the best idea to start the tour with three beers over 7% abv, but these were the ones I really wanted to try! Wayward Owl's beer menu for the day. Wayward Owl's space was originally the Gem Theater. 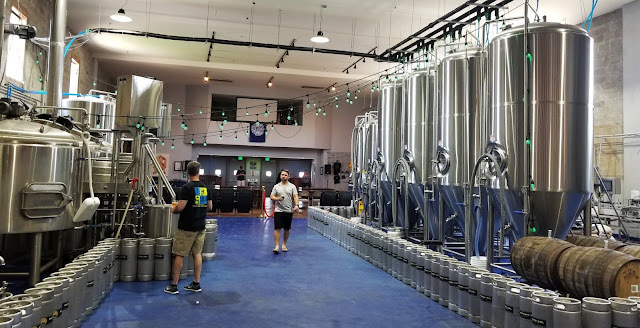 After a few rounds at Wayward Owl and a tour courtesy of Brewmaster Justin, it was off to Port Orleans, a relatively new brewery on Tchoupitoulas between Milan and Marengo. This brewery is gorgeous, with a clean stylish taproom build out, an ample front porch with outdoor seating, and a large patio to one side with picnic tables and yard games. It was too hot for anyone to really enjoy the outdoor spaces, but I know once Fall rolls around and the weather cools down, this place will be jumping indoors and out. Being a bit of a hop lover I went for the Partly Cloudy With A Chance For Hops first, then moved on to a Blowout DDH IPA. Of these two I preferred the Blowout, but the real hit was the third beer I tried, pour of their Barrel-Aged Offshore Chocolate Imperial Stout. That one hit all the right notes with the richness of the stout, chocolate notes, and a boozy oaky vanilla flavor from the barrel aging. Port Orleans Brewing Company and Stokehold Restaurant. The Port Orleans side patio, too hot for a crowd today. Port Orleans is also home to the Stokehold restaurant, and some food was much needed. After a quick browse I decided to get some mozzarella stuffed garlic bread to split with Jay, and it was amazing. 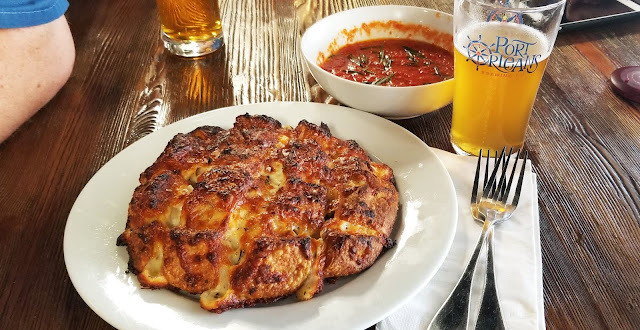 It was an excellent combination of buttery dough, garlic, mozzarella cheese, and a marinara for dipping. This is without a doubt one of the best taproom food items I've ever tried, and I would probably order it again the next time I'm here. Mozzarella stuffed garlic bread from Stokehold and the Blowout DDH IPA. 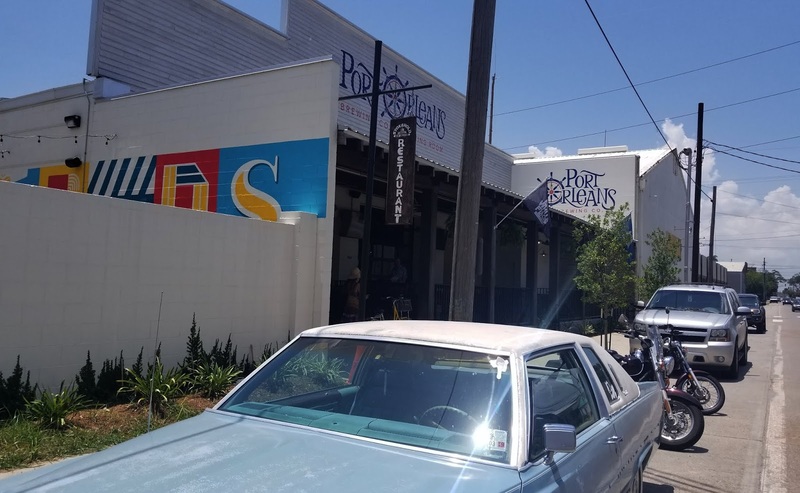 After Port Orleans it was time for a quick jaunt just under a mile down Tchoupitoulas to NOLA Brewing, the elder statesman of the craft brewing renaissance in New Orleans. 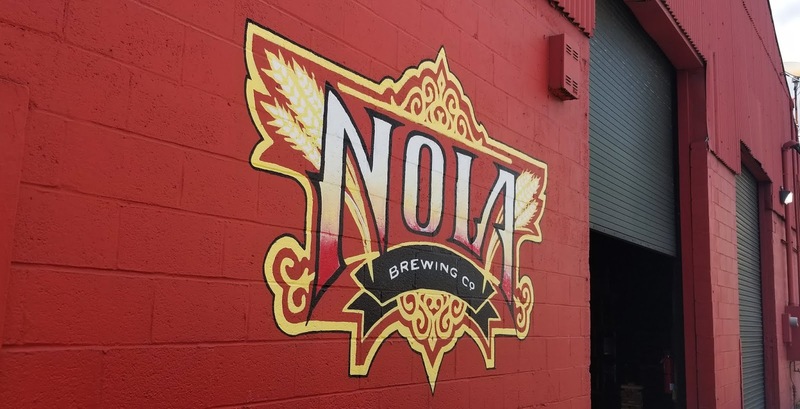 I was especially excited to get to NOLA as I had heard great things about the No Strings Attached NEIPA that released last weekend. It did not disappoint at all, hazy, juicy, hoppy and checking off every mark for a great NEIPA. I also tried a Twins Basil, Twins! (that's an Austin Powers reference in case you missed it) which is a mixed fermentation sour with citrus and basil. 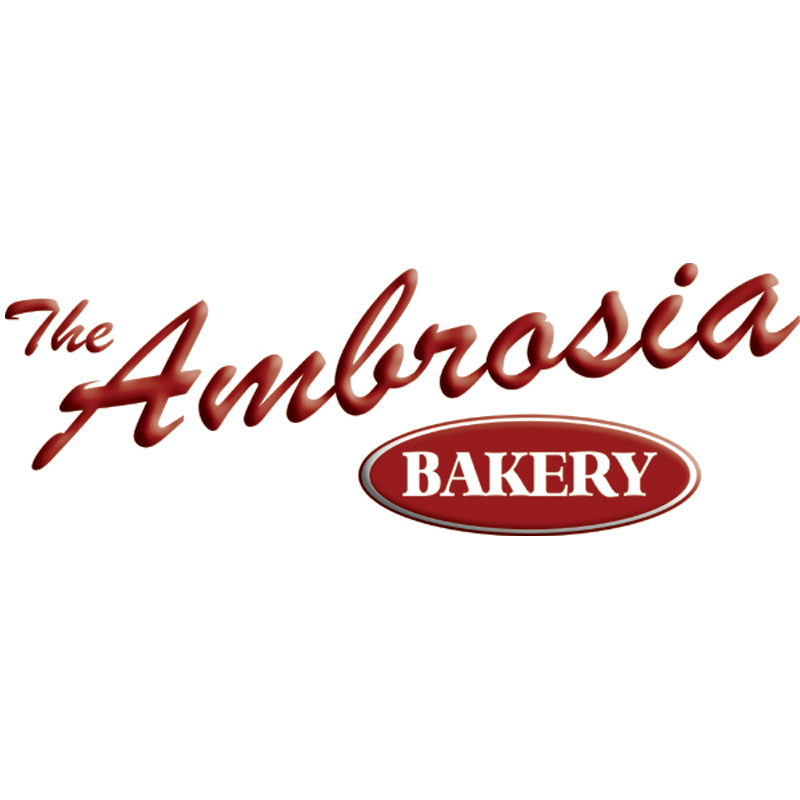 Although I did enjoy it, it was a little on the tart side for my tastes. Like Port Orleans, NOLA also has a restaurant on premise, in this case McClure's BBQ, so Jay ordered up a BBQ sampler to split and we enjoyed some excellent ribs, brisket, chopped chicken, and pulled pork with some sides of macaroni and cheese and seasoned waffle fries. Everything was delicious, but I think the baked mac & cheese stole the show a bit from the meats. The BBQ plate from McClure's and most of a No Strings Attached NEIPA. 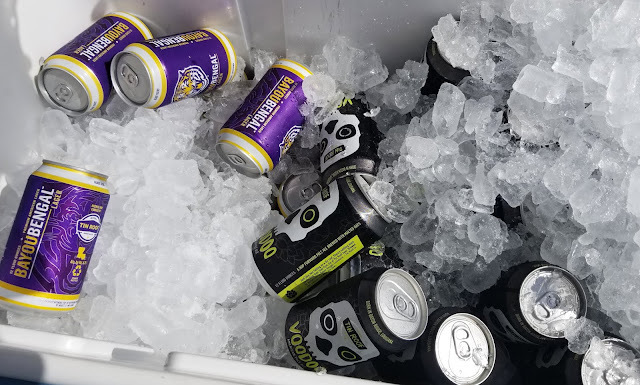 After that bite and a crowler snag, it was time to continue another short distance down Tchoupitoulas to Urban South Brewery, a brewery making waves for itself with flavorful gose style ales and phenomenal NEIPA releases to go with their flagships. 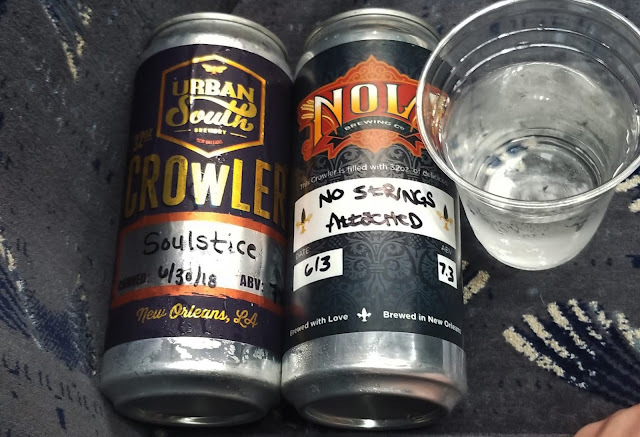 Just like NOLA, Urban South released a hyped NEIPA the week before, so I was excited to get in and try some of the Soulstice, a collaboration with Parleaux Beer Lab. Just like the No Strings Attached, this did not disappoint. I finished off the evening with a Suitcase Full Of Sparks and then decided it was time to switch to water for the ride home, but not before snagging another crowler for later! Urban South's taproom was jumping this Saturday afternoon. 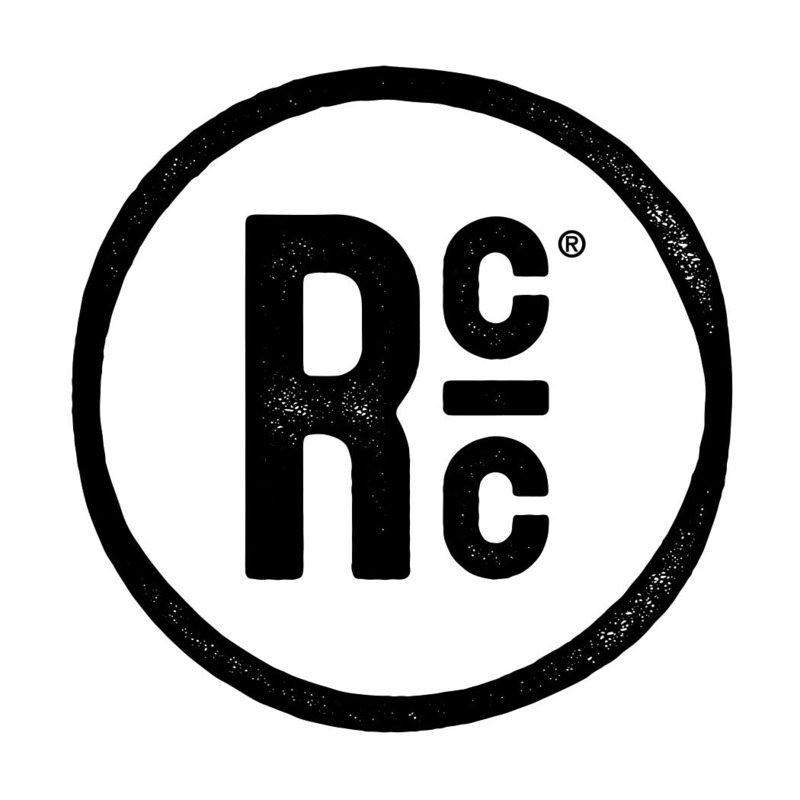 After a ride home full of Matt Moscona give-aways, it was back to Tin Roof and then back home, heavy a few crowlers and a souvenir glass. A couple of beers for later. Souvenir glassware, never a bad thing! 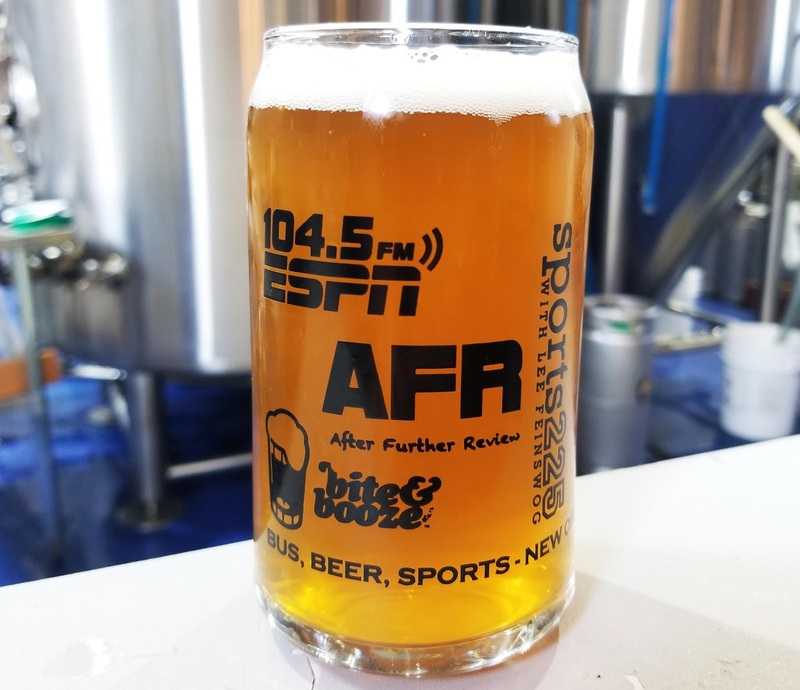 This was a really great time, I enjoyed hanging out with Jay, Matt, and Lee, and of course it was fantastic to see some new breweries and try some new beers all while having transportation taken care of. 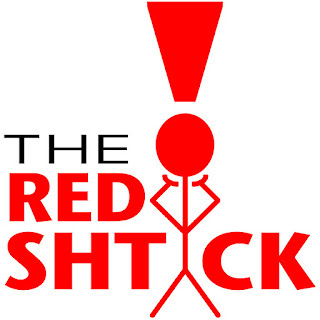 There are plans for a repeat event in early 2019, so be on the lookout, and grab your spot before they are gone!